Just a note to let our membership know what the South Kootenay Anglers Society has been up to. Our educational fish incubator program is in its seventh year. We have 4 fish incubators in 4 of our Creston area classrooms. Every Fall the South Kootenay Anglers Society supplies Kokanee eggs to these 4 classrooms of children. The children then watch and learn as these eggs mature and Kokanee fry. In April, of each year, the children in these 4 classrooms release the Kokanee fry into Summit Creek. In the Fall of 2001, the South Kootenay Anglers Society observed the return of the Kokanee coming to spawn in Summit Creek where they were first released. The South Kootenay Anglers Society wishes to give special thanks to the teachers involved in the educational fish incubator program for this school year. Lea Brocklesby of South Creston Elementary School, Denise Paquette of Wynndel Elementary School, Lois Huscroft of PCSS and, Jennifer Thorkelsson and Nicole Wood both of Erickson Elementary School. Without the efforts of our teachers this program could not be a success. Also thanks goes to Cindy Bennet for transporting the children safely to and from Summit Creek for the fry release. The South Kootenay Anglers Society also has a bursary program. 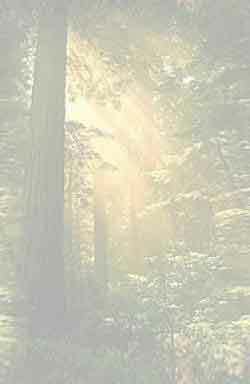 In June, 2001 the bursary was increased to $1000.00. This bursary is designated to PCSS students entering into post-secondary school in the field of Marine Biology or a related field. Last year's recipient was Erin Sabo who was registered at Lethbridge College in the field of Conservation. The Flag-A-Snag program is in its fifth year. In this program the South Kootenay Anglers Society makes up special flourescent markers so that boaters can mark floating debris and deadheads on Kootenay Lake. This program has helped make our lake a safer place for boaters and lake enthusiasts. Boswell boat launch and Bayshore Resort. The South Kootenay Anglers Society will also be involved in some repairs and maintenance at the Boswell boat launch this year in cooperation with the Boswell Farmer's Institute. 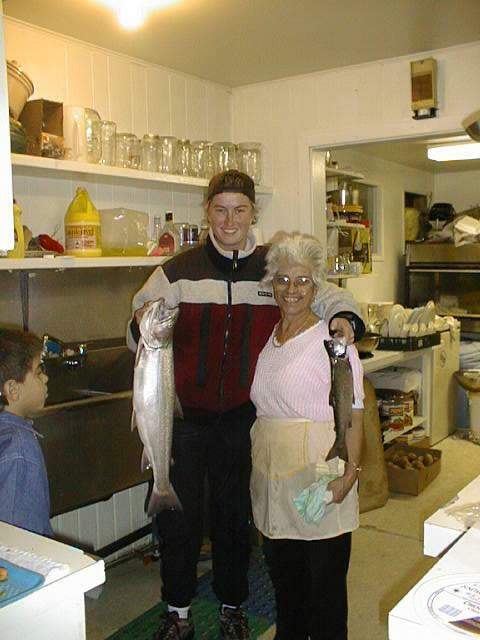 Please renew your South Kootenay Anglers Society membership for 2002. Memberships are available through South Kootenay Anglers Society directors Jerry Popovich or Walt Pozniak, or at Wynndel Foods. It is through support of our membership that the South Kootenay Anglers Society is able to continue with our various programs. Memberships entitle members names to be entered in our South Kootenay Anglers Society member jacket draw. The draw for the mnembership jacket is held each October at the South Kootenay Anglers Society annual fishing derby. Membership also entitles members to a discount on the member's fishing derby ticket. Don't forget your jacket size and your postal code. In return, your South Kootenay Anglers Society membersip will be sent out to you through the mail. 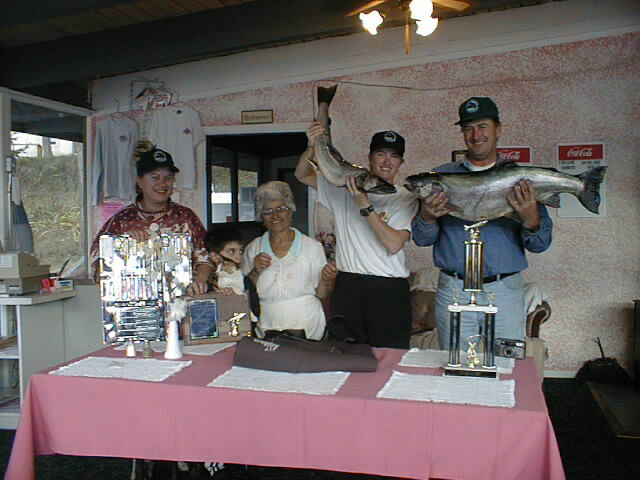 Pat Rauch was the largest rainbow and Grand Aggregate winner for the 2001 fishing derby. Bayshore Resort - Kootenay Lake, B.C.